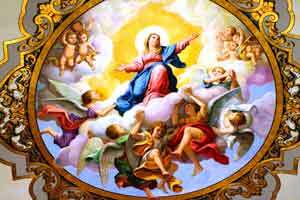 Assumption of Mary is a holiday that occurs on or around August 15th. Columbia celebrates this day on the third Monday of August. It is a feast in the honor of Jesus's mother, Virgin Mary. Most just have a feast in Virgin Mary's honor when she dies and when she ascends to heaven. It is a holiday that not all people get off and mainly Catholics celebrate it. This holiday has been around for a long time and its origins are unknown. However, according to the Catholic Church Mary died then rose from her grave to heaven just like Jesus.